Our School of Health and Social care uses a variety of mannequins to help students learn clinical skills in a simulated care environment in laboratories at the University. 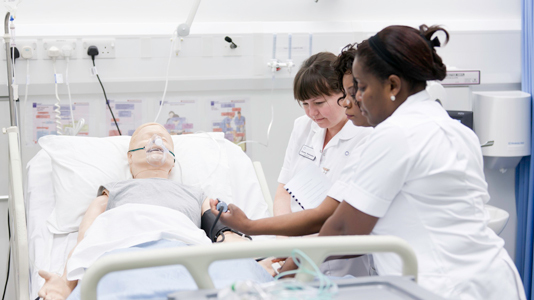 Students on Nursing, Midwifery and Allied Health courses work with the mannequins to prepare them for the workplace and enable them to further understand challenges that are regularly faced. SimMan's gender as well as its vital statistics – including respiration, pulse, blood pressure and oxygen saturation – can be varied by lecturers to demonstrate a variety of chronic and acute conditions. This enables lecturers to bring to life clinical cases which they have witnessed in their practice area, giving students the opportunity to work on a variety of tasks. Students are typically given a patient scenario prior to meeting the mannequin and are expected to do a full clinical assessment of the patient. They attend to the patient, recording their vital signs, note the monitoring and patients' activities, such as consciousness level, ability to breathe, urine output and blood pressure. They can even ask SimMan basic questions, as the lecturer can programme it with a number of pre-recorded answers. Whatever the students' suggest can be applied by the computer operator – even if it would make the patient's condition worse. The student can then respond to the changing situation. If the patient's condition begins to deteriorate, according to their specific condition the student would be expected to recognise what was happening and offer appropriate treatment modalities to improve their condition. When you're training there are lots of things that you can't carry out on patients. The SimMan means that we can practice things like CPR in a more realistic way." If the students make a good assessment and intervention they will see the mannequin's health improve. They are given time following a SimMan session to debrief and reflect on what went well and where improvements could be made. This gives staff the chance to understand how students make clinical assessments and how they judge what is required to treat patients without any real patients being put in any danger. Simulation is used as part of the School's technology assisted learning strategy along with role play, e- learning activities and taught lectures. This multi-faceted approach allows students to work with their lecturer and peer group to practise managing a range of patients to gain confidence and competence in caring for them prior to embarking on clinical placements. Students benefit from using the simulators so they can be confident they can do no real harm and so become absorbed into the realistic clinical scenario. Used properly, it gives students confidence that they would be useful in similar situations that arise within the clinical area. Simulation is also used to assess students' knowledge in mock clinical scenarios to demonstrate their clinical knowledge. Colin Winter, Lecturer in Orthopaedics at LSBU, says: "It's very exciting to offer students the opportunity to train with SimMan. There is extensive research which shows the positive effects of this kind of health education. Student responses to using the mannequins in teaching have been fantastic, with students highly rating the benefits of being able to practise their skills for the first time in a realistic environment where there is no risk to patient safety." Students generally spend half of their time on placements, so using SimMan gives them opportunities to familiarise themselves with working under pressure in a variety of different scenarios.